Windows - What brand of windows did you use on this project? Are they painted black wood inside? Beautiful project. This is super helpful. Thanks gain for your time. Your work is beautiful. Love the color of the floor. What brand and color is it? 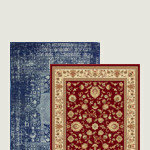 approximately $5 to $7 per sq.ft. Lighting - I love the three pendant fixture. Do you recall where it is from? Loving the clean lines of this space. 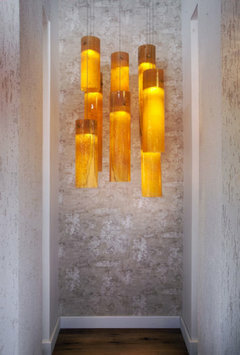 The lighting reminds me a bit of our Tanzania pendants that we make from fused glass. The white seat is from Ikea, but it has unfortunately been discountinued. Are the floors Bamboo? - Are the floors Bamboo? Yes, this floor is pre-finished bamboo. 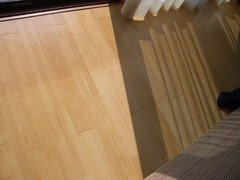 It is the bamboo floor with Lacquer,horizontal structure. Front door and window - Who make the front door? Is the door and window a combo from the window company? Can you tell me who makes the lever set? Thank you so much for being spot-on in detail. Its very helpful. Many responses I get are vague and unhelpful. Window color - Hello, Love the window color. Is this the standard Pella "brown" or a different brown offered in the expanded colors available from Pella? They look to have more gray than the standard Pella brown color. It somewhat resembles Iron Ore. I am glad you like the window color. This is standard Pella Impervia Brown (fiberglass). Best of luck with your project. 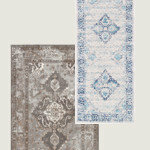 rug - love the rug where from? Love the stair railing! Where did you order from? Railing - Is this a cable railing? It's difficult to tell if is cable/wire, or solid. Panels on exterior - Did you use a combination of Hardie panels and Fry Reglet on the exterior? This siding is by CertainTeed, but it is used similarly to Hardi. 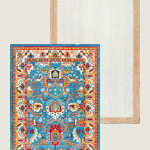 The details could be found on the Fry Reglet site: http://www.fryreglet.com/products-revealpaneltrim.htm. Recessed lights - What size can lights did you put throughout the house? Can you tell me the maker and bezel type? 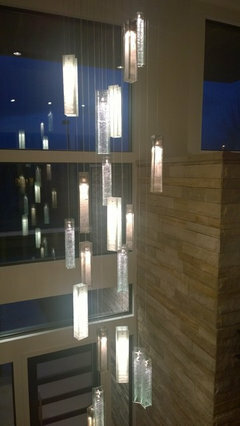 We make some fused glass lighting very reminiscent to the pendants in the stairwell. All can be customized to suit your space with almost any number of pendants. A very modern use of primary colors. Bright white sets it all off, so each piece is a little explosion of color. 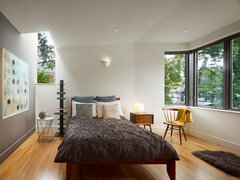 This room’s clean lines and modern furnishings are warmed up by the soft natural tone of the bamboo floor. Special ConsiderationsThere is an element of controversy as to whether bamboo flooring is an eco-friendly material. On the one hand, it’s a fast-growing plant available in vast quantities, making it a rapidly renewable resource. It also takes the pressure off other wood species, especially exotics. Bamboo reaches maturity in about five years, compared with hardwood trees that take a few decades. 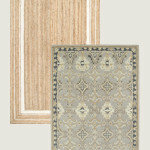 On the other hand, most bamboo flooring is made overseas, and shipping contributes to the material’s carbon footprint. Manufacturing practices abroad can also be questionable. It is important to note that most manufacturers of bamboo floors use a urea-formaldehyde resin during the manufacturing process. Some brands may contain adhesives and formaldehyde that emit toxic volatile organic compounds. Contact the manufacturer to address concerns about off-gassing, and look for the Forest Stewardship Council certificate, which indicates responsible forestry management. Good color as it’s not too light or dark. A little on the yellower side, but better than too orange. 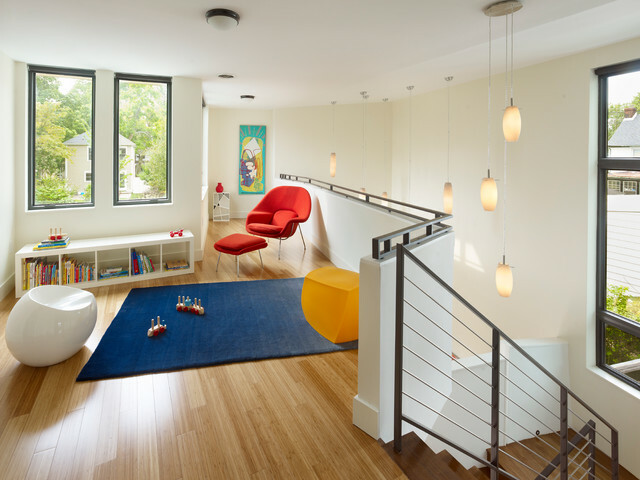 Smart Playroom in Greenwich, CT.